I purchased this little discovery kit back in December when I did some damage at TheFaceShop just before Christmas. My Rice Ceramide toner and emulsion were running dangerously low when I went in to pick up a new set, and saw this kit there. 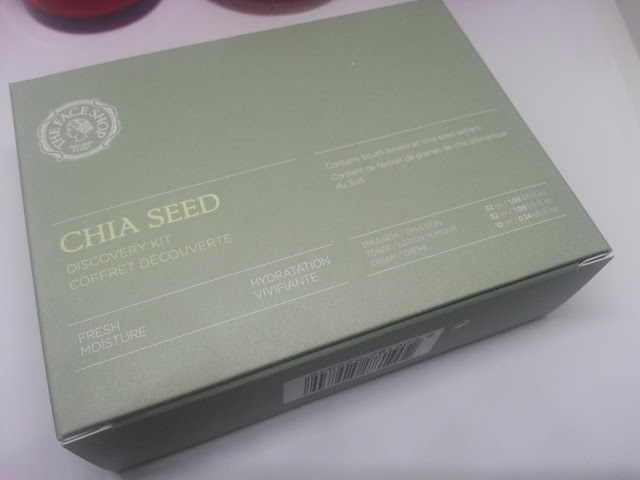 The sales associate recommended I try the Chia Seed line for dry skin, so I figured I would get a little trial set to see how it played with my skin. I always try and use skincare products for a few weeks before I provide a review on it, just because skincare is so personal, and your skin can react at any time. Like I mentioned above this is just a small discovery set, which means that these are just trial/travel size bottles. But I've been using them religiously for just over two months now, and have barely made a dent in them. The full size versions of the Rice Ceramide set, lasted me a year and a half. So it really goes to show how little you need, and how hydrating they feel. 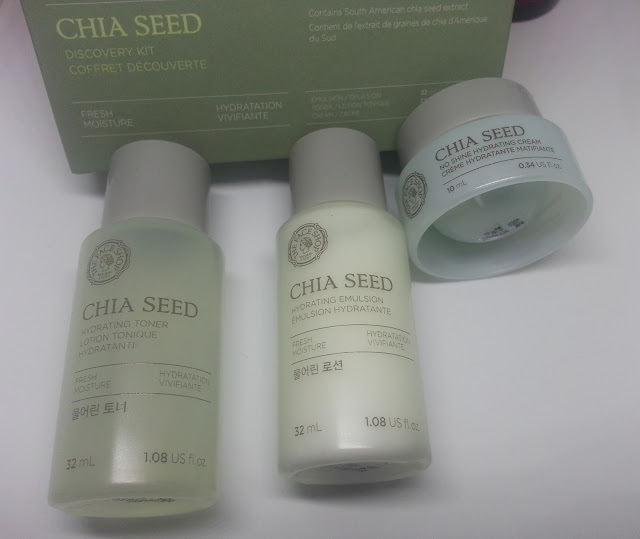 Included in the Chia Seed Discovery Kit is the Hydrating Toner, Hydrating Emulsion and No Shine Hydrating Cream. 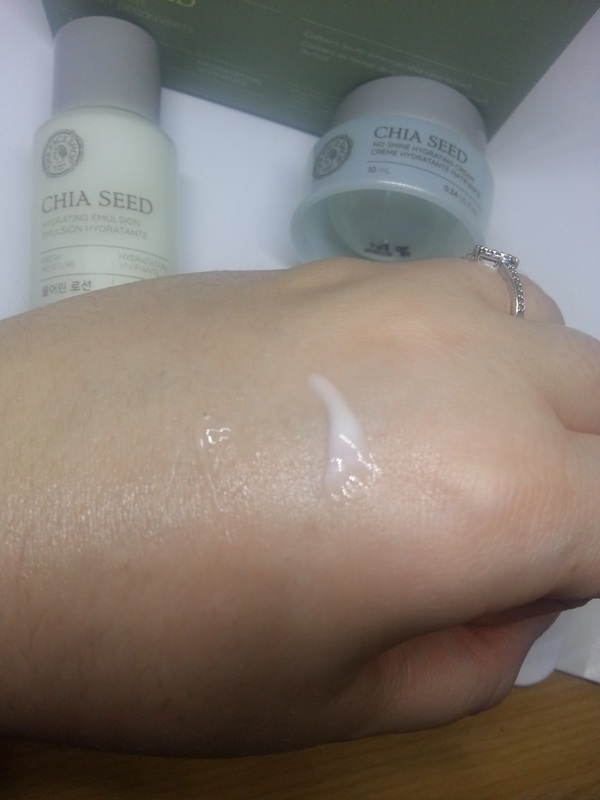 Chia Seed Extract gives your skin a surge of moisture. As you can see, the No Shine Hydrating Cream (left) is more of a gel consistency, and the Hydrating Emulsion looks like a lotion or cream product. Overall as a whole system, I have really been enjoying these products. The toner and emulsion immediately make my skin feel hydrated. I like to use the toner in the morning and at night. I usually only use the emulsion at night, but I will add it in the morning if I feel like my skin is looking, or feeling, extra dry. It's thicker than the Rice Ceramide emulsion, but it sinks in well. The No Shine Hydrating Cream works great under makeup. I have never had any issues with it pilling on my skin, but doesn't entirely mattify my skin either. I've learned that I'm starting to enjoy gel formulas more under my makeup, because they don't pill and they seem to sink into the skin a lot easier and faster - which is great in the morning. I'd definitely recommend trying this discovery kit out if you do have dry skin. It's affordable, and has lasted me already a few months, and have barely made a dent in the bottles. All three products keep my skin feeling hydrated, which is definitely needed during the winter months. I don't see it listed on the website, but take a look in the store, because that's where I picked mine up.